Mortgages make up a big part of a Canadian bank’s business model. This is a good indication that investing in mortgages is not only lucrative but also secure compared to many other alternative investment options. It’s our mission to open up the mortgage investment market to the public and add mortgages to your investment portfolio as an alternative to stock market-based assets, such as mutual funds. The IQInvest MIC provides a way for individuals and corporate investors to access Canadian real estate markets and take advantage of economies of scale not available to them as individuals. Investors pool their money by buying shares in a company called a Mortgage Investment Corporation (MIC). The MIC invests these funds in mortgages that generate a yield through interest rates and fees charged to the borrowers. This yield produces monthly cash flow for its investors. The MIC’s management is responsible for all facets of the MICs operations: sourcing of mortgage opportunities, analysis and underwriting of mortgages, and structuring and facilitating the related legal transactions. 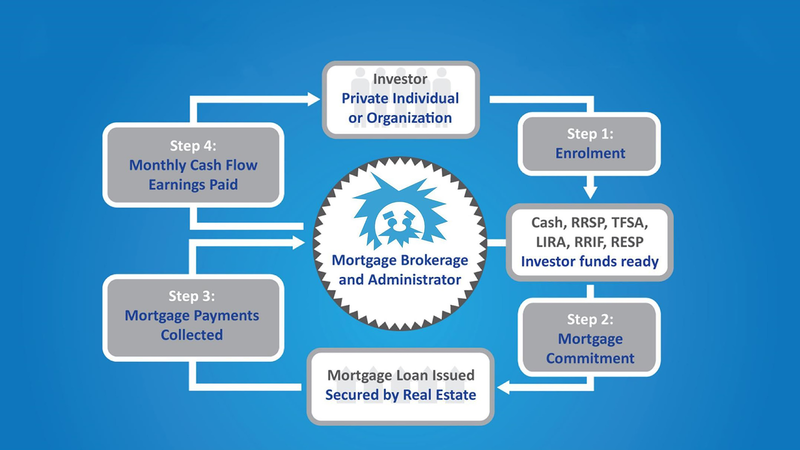 The MIC then manages and administers the entire mortgage portfolio comprised of these individual mortgage investments. Extensive oversight from different regulatory bodies ensures transparency and security. The Office of the Registrar of Mortgage Brokers at the Financial Institutions Commission regulates the mortgage brokering and lending activities of MICs under the Mortgage Brokers Act. We file our Offering Memorandum and audited financial statements annually with the Ontario Securities Commission. It is important for investors in a “Mortgage Investment Corporation” (MIC) to know as much as possible about the background, intent, structure, regulations and tax-exempt flow-through aspects of the MIC. Let’s define what a MIC is. A MIC is an investment that lets people pool their money to be invested in mortgages. All of the MIC’s net profit from the mortgages flows through to the MIC investors. MICs have been around since 1973 when federal legislation was enacted to promote private financing and make it easier to invest in mortgages. MICs are one of the lesser known asset classes despite yielding solid long-term returns and despite being RRSP, TFSA, RRIF and RESP eligible in most cases. A “Mortgage Investment Corporation” as defined under Section 130.1 of the Income Tax Act pay no corporate income tax and act as a flow-through entity, provided 100% of its taxable income gets paid out as dividends. 3) the adoption of a “conduit” or “flow-through” tax treatment as to the income of the mortgage investment corporations. It is with this last step that section 103.1 of the Income Tax Act is concerned. The income of a mortgage investment corporation is allowed to flow through to and be taxed in the hands of the shareholders as interest income. To help resolve these problems and to make residential mortgages competitive with other forms of investment and thereby attract private savings, the bill provides for a new form of Canadian financial institution, the Mortgage Investment Corporation (MIC), which is intended to make investment in residential mortgages and real estate more accessible to the small investor. It is extremely difficult at the present time for smaller investors to make this kind of investment. Unlike investment in securities, mortgage and real estate investments are legally and administratively cumbersome to split in such a way that investors can become owners of separate, divided interests. Backed by expert management service and the security of a diversified portfolio, mortgage investment companies will provide opportunities for the smaller investor to participate in mortgage and real estate investments, and in this way attract new savings into residential mortgages and real estate investments. The stated purpose of the Residential Mortgage Financing Act was “to enhance the marketability of mortgages issued on residential properties in Canada and improve the effectiveness of the contribution of the private sector to the financing of housing in Canada.” For this purpose special tax treatment was introduced that in effect treated the MIC as a conduit, flowing income earned on its investments through to its shareholders without the imposition of corporate tax. Investment in a MIC becomes particularly attractive for the various deferred income vehicles provided for in the Income Tax Act. These include Registered Retirement Savings Plans (RRSPs), Deferred Profit Sharing Plans (DPSPs) and Registered Pension Plans (RPPs). Such plans are prohibited from borrowing funds and are thus restricted to earning income on funds contributed to the plans or upon reinvestment of earnings. Thanks to the MIC these plans can indirectly enhance their earning capabilities by leveraging their investment in residential mortgages and enjoying a spread between the rate of interest paid on borrowed funds and the rate charged on the MIC’s residential mortgages. Since the income of the MIC can flow through to registered plans without intermediary tax and be reinvested by them, the MIC can retain the entire amount on a tax-free basis until distribution of funds from the plans to their beneficiaries. The corporation must be a Canadian corporation and must not do anything other than invest its funds. Specifically, it must not manage or develop any real property even though it may own the property as an investment. There are certain minimum and maximum investment criteria that a MIC must meet, and all are based on the cost of property acquired. At least 50% of the MIC’s property must be represented by mortgages on residential properties, as defined in the National Housing Act, together with cash on hand or deposits with a bank or other corporation whose deposits are insured by the Canada Deposit Insurance Corporation or the Quebec Deposit Insurance Board, or with a credit union. The cost of real property owned by the corporation must not exceed 25% of the cost of all of the MIC’s property. An exception is provided for real property that may have been acquired by foreclosure on a mortgage. 1) It is permitted to loan funds only on property located in Canada. 2) It is not permitted to make loans to nonresidents of Canada unless such loans are made on the security of real property located in Canada. 3) It is not permitted to acquire and hold shares of nonresident corporations. 4) It is not permitted to own real property that is located outside Canada. A MIC must have at least 20 shareholders, and no shareholder may own more than 25% of the issued shares of the company. Although a MIC is permitted to borrow for purposes of investment, there are restrictions on the amount it can borrow. Provided at least 2/3rds of the cost of its property is represented by residential mortgages or cash on deposit, it is permitted to borrow up to 5/6ths of the cost of its assets. If less than 2/3rds of the cost is represented by residential mortgages and cash on deposit, its borrowings cannot exceed 3/4ths of the cost of its property. In short, the MIC can borrow (leverage) up to 5 times the cost of its assets if 2/3rds of its assets are in residential mortgages and/or insured bank deposits. Where a MIC has paid taxable dividends to its shareholders during its taxation year, it is permitted to deduct the total amount of the taxable dividends in computing its income for the year. Similarly, where a MIC has realized a capital gain, it may elect to distribute the gain as a capital gains dividend to its shareholders. In short, dividends paid to MIC shareholders are treated as company expenses for tax purposes. Hence, a MIC is not taxed. Dividends received by shareholders are deemed to have been received as interest for tax purposes. A particular strength of the MIC arises through effective use of the leveraging that is permitted to a MIC and the spread that can be achieved between the cost of borrowing and the return that can be obtained on the MIC’s mortgages. As a simple example, if we assume that the initial contributions to the MIC total $100,000, the corporation could borrow up to 5 times this amount provided more than 2/3rds of its investments are represented by residential mortgages or cash on deposit. If it is assumed in this situation, for example, that the rate of return that can be obtained on the MIC’s mortgages is 7% and the total amount invested is $600,000 (the maximum funding that could be obtained utilizing the 5 times cost leverage allowance), the interest earned would be $42,000. The cost of borrowing the permitted maximum of 5 times equity is assumed to be 5% for a cost of $25,000, leaving a net income of $17,000. It can be seen that the return on invested capital of $100,000 is 17%. These funds would then be paid as dividends to the Registered Plan and may in turn be reinvested in the MIC at no tax cost. It is apparent that if the net income of $17,000 is reinvested the MIC can borrow a further 5 times equity and in the second year the potential income could be $19,890 for a net return of 17%. Note that the figure of 17% is before MIC operating costs and expenses. It can be seen that the potential accumulation of funds to Registered Plans using a compound rate of 17% is dramatic. There are MICs that have achieved this kind of return and greater depending on the mix of investments in the portfolio. When the potential yield available to the Registered Pension or Registered Savings Plan through use of a MIC is compared with the normal compound return that has been traditionally experienced in Registered Plans it is apparent that the performance of MICs has proved to be significantly better than guaranteed income or equity funds. 130.1. (1)(b) no deduction may be made under section 112 in respect of taxable dividends received by it from other corporations. received by the shareholder as interest payable on a bond issued by the corporation after 1971. 130.1. (3) Subsection 130.1(2) applies where the taxable dividend (other than a capital gains dividend) described in that subsection was paid during a taxation year throughout which the paying corporation was a mortgage investment corporation or within 90 days thereafter. (vii) in any other case, the dividend is deemed to be a capital gain of the taxpayer from the disposition of capital property after October 17, 2000 and in the year. 130.1. (4.1) Where at any particular time a mortgage investment corporation paid a dividend to its shareholders and subsection 130.1(4) would have applied to the dividend except that the corporation did not make an election under that subsection on or before the day on or before which it was required by that subsection to be made, subsections 131(1.1) to 131(1.4) apply with such modifications as the circumstances require. and, if it does not do so, the dividend is deemed to be in respect of capital gains from dispositions of property that occurred before February 28, 2000.
the total of the corporation’s net capital gains from the dispositions of property in each of the periods referred to in this subsection, and in this subsection net capital gains from dispositions of property in a particular period means the amount, if any, by which the corporation’s capital gains from dispositions of property in the particular period exceeds the corporation’s capital losses from dispositions of property in the particular period. 130.1. (4.4)(c) the portion of the dividend that is in respect of capital gains from dispositions of property that occurred in the year and in the period that begins at the beginning of October 18, 2000 and ends at the end of the year, is deemed to be that proportion of the dividend that the number of days that are in the year and in that period is of the number of days that are in the year. capital losses from dispositions of property in a year exceeds the corporation’s capital gains from dispositions of property in the year. 130.1. (5) Notwithstanding any other provision of this Act, a mortgage investment corporation shall be deemed to be a public corporation. 130.1. (6)(i) its liabilities did not exceed 5 times the amount by which the cost amount to it of all its property exceeded its liabilities, where paragraph 130.1(6)(h) is not applicable. defined for the purpose of that paragraph). 130.1. (8) For the purposes of subsection 130.1(6), a corporation that was incorporated after 1971 shall be deemed to have complied with paragraph 130.1(6)(d) throughout the first taxation year of the corporation in which it carried on business if it complied with that paragraph on the last day of that taxation year. the time the person last became a beneficiary under the trust or a member of the partnership. tion apply in subsections (3) to (9) and this subsection. “mortgage lender” “créancier hypothécaire>. means persons who are related to each other and who became so related after January 14, 1998. (a) an individual and (i) the individual’s child (as defined in subsection 70(10)) who is under 19 years of age, or (ii) the individual’s spouse; “specified shareholder” “actionnaire déterminé” “specified shareholder” has the meaning assigned by paragraph 130.1(6)(d) of the Act, as enacted by subsection (1). sources for in force information. 130.1(1)(a) 2001 c17 s127(1) 2001 Jun 14 R.A.
130.1(4)(a) 2001 c17 s127(2) 2001 Jun 14 R.A.
130.1(4)(b) 2001 c17 s127(3) 2001 Jun 14 R.A.
130.1(4.2) 2001 c17 s127(4) 2001 Jun 14 R.A.
130.1(4.3) 2001 c17 s127(4) 2001 Jun 14 R.A.
130.1(4.4) 2001 c17 s127(4) 2001 Jun 14 R.A.
130.1(4.5) 2001 c17 s127(4) 2001 Jun 14 R.A.
130.1(6)(d) 1999 c22 s53(1) 1999 Jun 17 R.A.
130.1(6)(f) 2001 c17 s214(1) 2001 Jun 14 R.A.
130.1(6)(g) 2001 c17 s214(2) 2001 Jun 14 R.A.
130.1(7) 1999 c22 s53(2) 1999 Jun 17 R.A.
History: S.C. 1973-74, c. 49, s. 18; S.C. 1977-78, c. 1, s. 64; S.C. 1985, c. 45, s. 75; S.C. 1986, c.
6, s. 75; S.C. 1988, c. 55, s. 118; S.C. 1994, c. 7, Sch. VIII, s. 75; S.C. 1995, c. 3, s. 40; S.C. 1998, c.
19, s. 156; S.C. 1999, c. 22, s. 53; S.C. 2000, c. 12, s. 142; S.C. 2001, c. 17, ss. 127, 214 (E). Short title 1. This Act may be cited as the National Housing Act.R.S., c. N-10, s. 1. “rental housing project” “rental housing project” means a housing project occupied or intended to be occupied primarily by a person other than the owner.”reserve” [Repealed, 1999, c. 27, s. 1] “semi-detached dwelling” [Repealed, R.S., 1985, c. 25 (4th Supp. ), s. 1] “title” [Repealed, R.S., 1985, c. 25 (4th Supp. ), s. 1] R.S., 1985, c. N-11, s. 2; R.S., 1985, c. 20 (2nd Supp. ), s. 7, c. 25 (4th Supp. ), s. 1; 1992, c. 1, s. 142, c. 32, s. 5; 1994, c. 35, s. 38; 1999, c. 27, s. 1. Debts treated as loans 2.1 (1) For the purposes of this Act, a transaction by which a person becomes indebted to a creditor is to be treated as the making of a loan from the creditor to the person. Persons treated as owner (2) If the Corporation is of the opinion that the circumstances so warrant, a lessee, a purchaser under an agreement or an occupant may be treated as an owner for the purposes of this Act.1999, c. 27, s. 2. Purpose 3. The purpose of this Act, in relation to financing for housing, is to promote housing affordability and choice, to facilitate access to, and competition and efficiency in the provision of, housing finance, to protect the availability of adequate funding for housing at low cost, and generally to contribute to the well-being of the housing sector in the national economy.R.S., 1985, c. N-11, s. 3; 1992, c. 32, s. 6; 1999, c. 27, s. 2. Her Majesty has rights and obligations of the Corporation 4. Every right or obligation acquired or incurred by the Corporation under this Act, whether in its name or in the name of Her Majesty, is a right or obligation of Her Majesty.R.S., c. N-10, s. 4. Designation 5. (1) The Corporation may designate any person as an approved lender for the purposes of this Act. Term of designation (2) The designation of an approved lender and any renewal of that designation are in force for any period that the Corporation may specify. Conditions and restrictions (3) The Corporation may, at any time, establish conditions and restrictions applicable to an approved lender. Suspension (4) The Corporation may, at any time, suspend or cancel the designation of an approved lender. Fees (5) The Corporation may establish schedules of fees payable by approved lenders in relation to their designation and supervision.R.S., 1985, c. N-11, s. 5; R.S., 1985, c. 25 (4th Supp. ), s. 2; 1999, c. 27, s. 3. (f) on such terms and conditions as are specified by the Corporation, act as agent for the Corporation in the exercise of any of the Corporation’s powers and functions under Part I and in the making or administering of loans that the Corporation is authorized to make. Restriction of powers (2) The Corporation may restrict the powers that an approved lender may exercise under subsection (1).R.S., 1985, c. N-11, s. 6; 1999, c. 27, s. 3. Definition of “housing loan” 7. In this Part, “housing loan” means a loan that(a) relates to a housing project;(b) is secured at least in part by security on or affecting a housing project or by an agreement relating to the use, occupancy or disposal of a housing project;(c) is made for the purpose of acquiring a financial interest in a person who, directly or indirectly, owns, leases or operates a housing project; or(d) is made for the purpose of refinancing a debt that the Corporation is of the opinion relates to a housing project or to a financial interest referred to in paragraph (c).R.S., 1985, c. N-11, s. 7; R.S., 1985, c. 25 (4th Supp. ), s. 3; 1992, c. 32, s. 8(F); 1999, c. 27, s. 3. Payments by Corporation for completion 9. If the Corporation has insured a loan that has been provided to finance the completion of work relating to, or the supply of materials for, a housing project and the work has not been completed, the materials have not all been supplied or the work or materials have not been fully paid for, the Corporation may make loans or payments for the completion of the work or the supply of the materials or for the satisfaction of claims in respect of the project.R.S., 1985, c. N-11, s. 9; R.S., 1985, c. 25 (4th Supp. ), s. 6; 1999, c. 27, s. 3. Avoiding or curing defaults 10. (1) The Corporation may make payments to approved lenders or to holders of insured loans, and may make loans or payments to borrowers or their assignees, for the purpose of avoiding or curing, in whole or in part, default under insured loans or facilitating variation of the terms of payment of insured loans, or for any other purposes that the Corporation considers appropriate to protect its interest as an insurer. Subrogation (2) If the Corporation makes a payment to an approved lender or holder of an insured loan under subsection (1), the Corporation is subrogated, to the extent of the amount of the payment, to all the rights and interests of the lender or holder in respect of that amount, and may maintain an action in respect of those rights and interests in the name of the lender or holder or in the name of the Corporation. Any money recovered by the lender or holder must first be applied against money owing to the lender or holder on account of the insured loan. Waiver (3) The Corporation may waive the right of subrogation referred to in subsection (2).R.S., 1985, c. N-11, s. 10; R.S., 1985, c. 20 (2nd Supp. ), s. 8, c. 25 (4th Supp. ), s. 7; 1999, c. 27, s. 3. Administration of housing loans 12. The Corporation may administer a housing loan by agreement with the holder of the loan.R.S., 1985, c. N-11, s. 12; R.S., 1985, c. 25 (4th Supp. ), s. 9; 1992, c. 32, s. 11; 1999, c. 27, s. 3. Corporation may lend 13. The Corporation may make a housing loan in any of the following circumstances:(a) where the loan would otherwise not be available to the borrower;(b) where the Corporation intends to(i) make a contribution to the borrower,(ii) make another loan, or advances on another loan, to the borrower, or(iii) forgive any indebtedness of the borrower to the Corporation; or(c) where the Corporation is a party to an agreement respecting the operation of the housing project to which the loan relates. R.S., 1985, c. N-11, s. 13; R.S., 1985, c. 25 (4th Supp. ), s. 9; 1992, c. 32, s. 12; 1999, c. 27, s. 3. Interest rate protection 16. The Corporation may provide protection against the effects of changes in interest rates for housing loans.R.S., 1985, c. N-11, s. 16; R.S., 1985, c. 25 (4th Supp. ), s. 11; 1992, c. 32, s. 19; 1999, c. 27, s. 3. Dealing in obligations by Corporation 17. The Corporation may(a) acquire housing loans or interests in housing loans;(b) make loans to the holders of housing loans;(c) sell any obligation held by the Corporation and may, under an agreement made with the purchaser, continue to administer the obligation; and(d) issue securities based on housing loans.R.S., 1985, c. N-11, s. 17; R.S., 1985, c. 25 (4th Supp. ), s. 12; 1992, c. 32, s. 20; 1999, c. 27, s. 3. Reinsurance 18. (1) The Corporation may obtain reinsurance with respect to the risk covered by the Corporation in respect of any insurance, guarantee or other protection provided by the Corporation under this Part. Payment to Receiver General (2) The Corporation may pay to the Receiver General amounts determined in accordance with the Corporation’s corporate plan approved under section 122 of the Financial Administration Act to compensate Her Majesty for Her exposure to the risks covered under this Part by Her agent the Corporation. Those amounts are, for the Corporation, expenses of carrying on business under this Part.R.S., 1985, c. N-11, s. 18; R.S., 1985, c. 25 (4th Supp. ), s. 12; 1992, c. 32, s. 21; 1999, c. 27, s. 3. Terms and conditions 19. The Corporation may(a) set the terms and conditions on which it exercises any powers or functions under this Part, including terms and conditions relating to the payment of claims in respect of any insurance, guarantee or other protection provided by the Corporation under this Part; and(b) establish schedules of premiums, fees and charges for anything done in the exercise of any powers or functions of the Corporation under this Part.R.S., 1985, c. N-11, s. 19; R.S., 1985, c. 25 (4th Supp. ), s. 13; 1992, c. 32, s. 22; 1999, c. 27, s. 3. Establishment of funds 21. (1) The Corporation must establish and maintain funds to provide for claims, losses, expenditures and costs relating to the conduct of its business under this Part. Corporate plan (2) The Corporation’s corporate plan required under section 122 of the Financial Administration Act must contain a proposal that the Corporation’s profits from the conduct of its business under this Part that are not credited to a fund established under subsection (1) be used for one or more of the following purposes:(a) the capitalization of the Corporation’s business under this Part;(b) the payment of a dividend to the Consolidated Revenue Fund;(c) the purposes of this Act or the Canada Mortgage and Housing Corporation Act or any other purpose authorized by Parliament relating to housing; and(d) retention. Implementation of proposal (3) The Corporation is authorized to implement a proposal referred to in subsection (2) after the proposal is approved under section 122 of the Financial Administration Act as part of the Corporation’s corporate plan. Contractual guarantee of return from rental housing project 22. (1) The Corporation may enter into contracts with builders of rental housing projects to guarantee in each contract a financial return from a rental housing project after its completion in an amount to be determined by the Corporation for a total period of not more than thirty years. Undertaking to enter into contract (2) The Corporation may give to a builder an undertaking that the Corporation will enter into a contract with the builder under subsection (1) if the builder builds a rental housing project. Terms and conditions (3) The Corporation may determine the terms and conditions on which it enters into a contract in respect of a rental housing project under subsection (1), including, without limiting the generality of the foregoing,(a) fees with respect to any guarantee referred to in subsection (1);(b) conditions with respect to the operation or occupancy of the project;(c) restrictions on the disposal, leasing or charging of the project or any part of it or interest in it;(d) limits on the amount of the financial return that may be made from the project; and(e) provisions giving the Corporation the right to direct the use of any amount received in excess of any limits referred to in paragraph (d). Consent to assign (4) A contract referred to in subsection (1) is personal to the builder of the rental housing project to which the contract relates and may be assigned to a subsequent owner of the rental housing project only with the written consent of the Corporation.R.S., 1985, c. N-11, s. 22; 1992, c. 32, s. 29; 1999, c. 27, s. 4. Loans for rental housing projects 23. (1) Any approved lender who is subject to the jurisdiction of Parliament may, notwithstanding any restrictions on the power of the lender to lend or invest money contained in any other statute or law,(a) make loans for rental housing projects in respect of which an undertaking has been given by the Corporation under subsection 22(2) or the financial return has been guaranteed by the Corporation under section 22; and(b) dispose of or acquire loans made for rental housing projects in respect of which the financial return has been guaranteed by the Corporation under section 22, together with any security taken in respect of the guarantee. Terms and conditions (2) A loan may be made under paragraph (1)(a) only with the approval of the Corporation and on such terms and conditions as may be determined by the Corporation. Restriction of powers (3) The Corporation may restrict the powers that an approved lender may exercise under subsection (1).R.S., 1985, c. N-11, s. 23; 1992, c. 32, s. 30; 1999, c. 27, s. 4. Loans, etc., with respect to rental housing projects 25. (1) The Corporation may make loans and contributions with respect to rental housing projects, make loans to refinance debt that, in the opinion of the Corporation, relates to rental housing projects and forgive amounts owing on those loans. Life insurance companies investment 32. (1) Any life insurance company subject to the jurisdiction of Parliament may, notwithstanding any restriction on the power of the company to lend or invest money contained in any other statute or law,(a) subject to the conditions set out in subsection (2), invest its funds, to an aggregate amount not exceeding five per cent of its total assets in Canada, as shown in its most recent annual return filed under section 665 of the Insurance Companies Act, in the purchase of land and the construction thereon of a low cost or moderate cost rental housing project, including such buildings or such accommodation for retail stores, shops, offices and other community services, but not including hotels, as the company may deem proper and suitable for the convenience of the tenants of that rental housing project; and(b) after investing its funds pursuant to paragraph (a), hold, maintain, repair, alter, demolish, reconstruct, manage, collect or receive income from, sell or convey, in whole or in part, land acquired by means of the investment and the improvements on the land. (d) the investment is approved by the Corporation. Guarantee to life insurance company (3) Where a life insurance company agrees with the Corporation(a) to maintain, in relation to a rental housing project in which the company invests under this section, separate books and records satisfactory to the Corporation and open to its inspection at any time,(b) to establish, on account of the project, a reserve comprising all net earnings in any year after completion of the project that are in excess of seven per cent per annum on the cost of the project, and(c) to repay out of the reserve any advances made by the Corporation under the guarantee given pursuant to this subsection,the Corporation shall guarantee to the company, for as long as it retains ownership of the whole or any part of the project, a net return in any year after the completion of the project of three per cent per annum of the cost of the project for a period not exceeding the estimated useful life of the project and in any case not exceeding fifty years. Definition of “net return in any year” (4) In this section, “net return in any year” means an amount equal to annual net earnings derived from the project computed by deducting from the total annual revenues therefrom all expenses of the year in respect thereof, including provision for taxes, insurance, repairs and maintenance, interest and an amount sufficient to amortize the cost of construction of the project, including the cost of the land, over the estimated useful life of the project. Two or more companies (5) Two or more life insurance companies may join in the development, ownership and management of a rental housing project under this section. Power of Governor in Council to designate approved lenders (6) The Governor in Council may, for the purposes of this section, designate(a) an approved lender subject to the jurisdiction of Parliament, to which lender, if designated under this paragraph, subsections (1) to (5) apply, with such modifications as the circumstances require, but the amount of its funds that may be invested shall not exceed five per cent of its assets in Canada or such amount as is approved by the Governor in Council for the purposes of this subsection; and(b) an approved lender that is not subject to the jurisdiction of Parliament but is empowered to make investments referred to in this section, to which lender, if designated under this paragraph, subsections (2) to (5) apply, with such modifications as the circumstances require, but the amount of investments in respect of which guarantees may be given under this section shall not exceed five per cent of its assets in Canada or such amount as is approved by the Governor in Council for the purposes of this subsection.R.S., 1985, c. N-11, s. 32; R.S., 1985, c. 18 (3rd Supp. ), s. 37; 1991, c. 47, s. 739; 1999, c. 27, s. 5. Power of Corporation to determine administrative matters 33. (1) The Corporation may(a) prescribe the manner in which the cost of a rental housing project shall be calculated for the purposes of section 32;(b) adjust the cost of a rental housing project in the event of the sale of a portion thereof or an addition thereto;(c) prescribe the manner in which the net earnings shall be calculated for the purposes of section 32; and(d) take such other measures as the Corporation may deem necessary or desirable to give effect to the purposes or provisions of this section and section 32 and to safeguard the interests of the Corporation. Definition of “investment” 38. In this Part, “investment” includes the purchase price of land, moneys expended on the installation of services, the laying out and construction of streets, sidewalks and lanes and the development of park areas, public space and facilities appropriate to a residential housing development, and such carrying charges and other expenses incurred by the company in respect of the land as may be approved by the Corporation, including taxes, insurance, repairs and maintenance.R.S., c. N-10, s. 20. Company may invest funds in purchase of land for housing development 39. (1) Any life insurance, trust or loan company subject to the jurisdiction of Parliament (in this Part called “company”) may, notwithstanding any restriction on the power of the company to lend or invest money contained in any other statute or law,(a) subject to the conditions set out in subsection (2), invest its funds in the purchase and improvement of land to be used for a residential housing development to an aggregate amount that, when added to the aggregate amount invested by the company under section 32, does not exceed the limitation on the investment imposed by or pursuant to section 32 or 33; and(b) subject to this Part, hold, maintain, repair, alter, demolish, improve, manage, collect or receive income from, sell or convey, in whole or in part, land acquired by means of investment pursuant to paragraph (a) and the improvements on the land. Conditions of investment (2) The conditions under which an investment referred to in subsection (1) may be made are as follows:(a) the land shall, in the opinion of the Corporation, be suitable for a residential housing development;(b) the purchase price of the land shall be satisfactory to the Corporation;(c) the improvements to be effected and the cost thereof shall be satisfactory to the Corporation;(d) the company shall submit to the Corporation an application in a form satisfactory to the Corporation containing such information and accompanied by such material as the Corporation may prescribe;(e) the investment shall first be approved in writing by the Corporation; and(f) the company shall enter into an agreement with the Corporation in accordance with subsection (3). In case of agreement Corporation to guarantee return and interest (3) Where a company agrees with the Corporation(a) to acquire land and effect improvements thereon in accordance with this Part,(b) to maintain, in relation to the land, the expenses incurred in respect thereof, the improvements made thereon and sales made thereof, separate books and records satisfactory to the Corporation and open to its inspection at any time, and(c) to sell the land at such price as the Corporation may determine and on such terms and conditions as are satisfactory to the Corporation or as may be set out in the agreement,the Corporation shall guarantee to the company for as long as it retains ownership of the whole or any part of the land in which an investment is made pursuant to this Part but not longer than the time specified in the agreement, which shall not exceed five years after the date of acquisition of the land by the company, the return of an amount equal to the company’s investment in the land, together with interest thereon at a rate specified in the agreement but not in excess of three per cent per annum compounded annually. Further provisions of agreement (4) The agreement referred to in subsection (3) may also provide(a) that the company shall plan the development of the land in a manner satisfactory to the Corporation and, as a condition of the sale of the land, shall receive an undertaking from the purchaser that any structures erected on the land shall conform to the plan of the area and shall comply with standards of construction prescribed by the Corporation under this Act; and(b) for such other measures to be taken by the Corporation and the company as the Corporation may deem necessary or desirable to give effect to the purposes or provisions of this Part and to safeguard the interests of the Corporation.R.S., c. N-10, s. 20. Corporation to determine amount of investment and interest and amount recovere 40. (1) At the end of the time specified in the agreement referred to in subsection 39(3), or when all the land has been sold by the company, whichever is the earlier, the Corporation shall(a) determine the aggregate amount of the investment by the company in the land and the interest thereon at the rate specified in the agreement compounded annually; and(b) determine the amount recovered by the company out of the land from sales thereof or otherwise. When Corporation to pay excess (2) If the aggregate amount determined pursuant to paragraph (1)(a) is in excess of the amount determined pursuant to paragraph (1)(b), the Corporation shall pay to the company the amount of the excess and the company shall transfer and convey to the Corporation all the unsold portion of the land. When company to pay excess (3) If the amount determined pursuant to paragraph (1)(b) is in excess of the amount determined pursuant to paragraph (1)(a), the company shall pay the amount of the excess to the Corporation. Companies may join in purchase (4) Two or more companies may join in the purchase and improvement of land for a residential housing development under this Part.R.S., c. N-10, s. 20. Governor in Council may designate lenders as companies 41. (1) The Governor in Council may designate as a company, for the purposes of this Part,(a) an approved lender subject to the jurisdiction of Parliament, to which lender, if designated pursuant to this paragraph, sections 38 to 40 apply, with such modifications as the circumstances require, but the amount of its funds that may be invested shall not exceed five per cent of its assets in Canada or such amount as is approved by the Governor in Council for the purposes of this Part; and(b) an approved lender that is not subject to the jurisdiction of Parliament, but is empowered to make investments referred to in this Part, to which lender, if designated pursuant to this paragraph, sections 38 to 40 apply, with such modifications as the circumstances require, but the amount of investments in respect of which guarantees may be given under this Part shall not exceed five per cent of its assets in Canada or such amount as is approved by the Governor in Council for the purposes of this Part. Regulations (2) The Governor in Council may make regulations to provide for any matters concerning which the Governor in Council deems regulations are necessary or desirable to carry out the purposes or provisions of this Part. Corporation may take necessary measures (3) The Corporation may take such measures as it deems necessary or desirable to give effect to the purposes or provisions of this Part and to safeguard the interests of the Corporation.R.S., c. N-10, s. 20. Land acquisitions of Corporation 42. (1) The Corporation may, for the purpose of leasing land at low rentals to non-profit corporations,(a) acquire land by way of purchase, lease or otherwise; and(b) install services in, and effect improvements to or in respect of, land acquired by it and develop and lay out the land for housing purposes. Lease of land by Corporation (2) The Corporation may lease land acquired under subsection (1) to non-profit corporations but the rentals charged thereon by the Corporation shall not be less than such amounts as are determined in such manner as may be prescribed by regulation. (3) and (4) [Repealed, 1992, c. 32, s. 35]R.S., 1985, c. N-11, s. 42; 1992, c. 32, s. 35. Assistance for repair, etc. 51. (1) The Corporation may make loans and contributions for the purposes of the repair, rehabilitation, modification, improvement and conversion of housing projects, and may forgive amounts owing on those loans. Owner-occupier loans, etc. 57. (1) The Corporation may make loans and contributions in respect of housing projects occupied or intended to be occupied by the owner of the project, make loans to refinance debt that, in the opinion of the Corporation, relates to such a housing project, and forgive amounts owing on those loans. Terms and conditions (2) The Corporation may determine the terms and conditions on which it makes a loan or contribution or forgives an amount under subsection (1).R.S., 1985, c. N-11, s. 57; 1999, c. 27, s. 8. Loans, etc., for housing expenses 58. (1) The Corporation may make loans and contributions for the purpose of assisting in the payment of, or providing allowances for, expenses that, in the opinion of the Corporation, are related to housing accommodation, and may forgive amounts owing on those loans. Terms and conditions (2) The Corporation may determine the terms and conditions on which it makes a loan or contribution or forgives an amount under subsection (1).R.S., 1985, c. N-11, s. 58; 1991, c. 47, s. 740; 1999, c. 27, s. 8. Loans, etc., to cooperative associations 61. (1) The Corporation may make loans and contributions to cooperative associations and to their members in respect of housing projects, make loans to cooperative associations and their members to refinance debt that, in the opinion of the Corporation, relates to a housing project, and forgive amounts owing on those loans. Housing investigations and distribution of information 73. It is the responsibility of the Corporation to cause investigations to be made into housing conditions and the adequacy of existing housing accommodation in Canada or in any part of Canada and to cause steps to be taken for the distribution of information leading to the construction or provision of more adequate and improved housing accommodation and the understanding and adoption of community plans in Canada.R.S., c. N-10, s. 35. (g) generally such steps to be taken as it may deem necessary or advisable to encourage the development of better housing and sound community planning and to promote construction of housing accommodation that, in its opinion, is sound and economical. R.S., c. N-10, s. 36. (j) carry out research and planning and provide services and information that relate to the financing of housing, housing affordability and choice, living environments or community planning, or that are intended to contribute to the well-being of the housing sector in the national economy. Approval required (2) The powers of the Corporation under paragraphs (1)(g) and (i) may be exercised only with the approval of the Governor in Council. Underwriting sales (3) The Corporation may, with the approval of the Governor in Council, enter into a contract with a manufacturer referred to in paragraph (1)(f) to underwrite the sale, at such price as may be agreed on and specified in the contract, of the equipment or component parts referred to in that paragraph, manufactured or produced for installation or use in homes, if the manufacturer manufactures or produces the equipment or component parts in such volume as may be agreed on and specified in the contract. Contracts for sale and distribution (4) The Corporation may, with the approval of the Governor in Council, enter into contracts with the manufacturer referred to in subsection (3) or any other person for the sale or distribution, in such manner as it may deem advisable, of the equipment or component parts referred to in that subsection. Limitation (5) The maximum contingent liability of the Corporation under contracts entered into under subsection (3) shall not at any time exceed ten million dollars, and any amounts required to be paid by the terms of those contracts may be paid under section 29 of the Financial Administration Act.R.S., 1985, c. N-11, s. 75; 1999, c. 27, s. 11. Q. Who borrows from IQI MIC? A. While banks are readily available sources of loans, recent legislation has required banks to adjust and restrict their mortgage lending policies. Borrowers who previously qualified for bank loans may now be rejected. This is where IQI MIC can step in and fill the gap. Investors, through the MIC, can assist these individuals, while earning a healthy and stable return..
Q. How am I taxed? A. Your returns are taxed as interest, not dividends. Q. Is MIC investments registered investment eligible? Q. Can I invest through my RRSP or TFSA as well as cash? A. Yes, IQInvest MIC is an investment for all Canadian registered plans, examples being the RRSP and Spousal RRSP, RRIF, TFSA, RESP, RDSP, LIF, LRIF, LIRA and IPP. Many IQI investors invest both cash and registered funds. Q. Can I transfer my registered plan to IQI? A. Yes you can. We handle the transfer for you. Q. How long is my money committed? A. Your funds are committed for 1 year when investing in our Class A Shares and 3-years when investing in our Class B Shares. You choose. Our Class B Shares offers a Early Redemption clause to redeem the investment earlier than its due date (subject to a early redemption penalty). Q. What fees are associated with investing? A. At IQInvest there are no start up fees associated with opening an account. Registered accounts cost $150 per year ($42.38 payable quarterly) and a $50 one-time share purchase fee. Q. Are investors notified of when their investment is due? A. Yes, with each Quarterly Statement investors are provided details of investments maturing the following quarter. Q. How is my investment secured? A. IQI investors are value investors. They are long-term thinkers who have faith in the enduring value of Canadian real estate property. They are not interested in the quick buck, volatility and its associated risks. They like regular income and growth through compound interest. IQI’s investments are secured by valuable Canadian real estate and personal guarantees of mortgage borrowers. Q. What is the typical investment amount? A. There is no ‘typical’ investment amount. You may invest as little as $25,000 and you may make monthly contributions to your investment account. Q. What kind of mortgages does IQI invest in? A. Our mortgages are secured by Canadian real estate located in Canada, primarily in Ontario. We lend based on the value of property and credit-worthiness of our borrowers. MICs can also be a more secure and safe option compared to investing directly in real estate. When you invest in a MIC, you are investing in mortgages, which are less vulnerable to fluctuating property values. MICs also offer protection in the form of a fixed interest rate during the investment period.